Grassroots Journalism in the Digital Age: Innovate or Perish! I just spoke to a group of 75 provincial level provincial journalists in Sri Lanka who were drawn from around the island. They had completed a training course in investigative journalism conducted by Transparency International Sri Lanka (TISL), with support from InterNews. 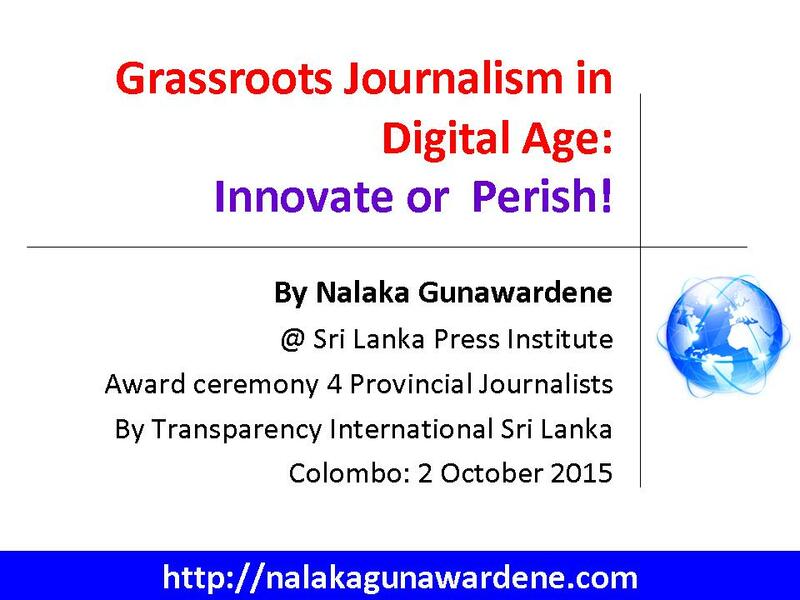 The certificate award ceremony was held at Sri Lanka Press Institute (SLPI), Colombo, on 2 October 2015. In this talk, I look at the larger news media industry in Sri Lanka to which provincial journalists supply ground level news, images and video materials. 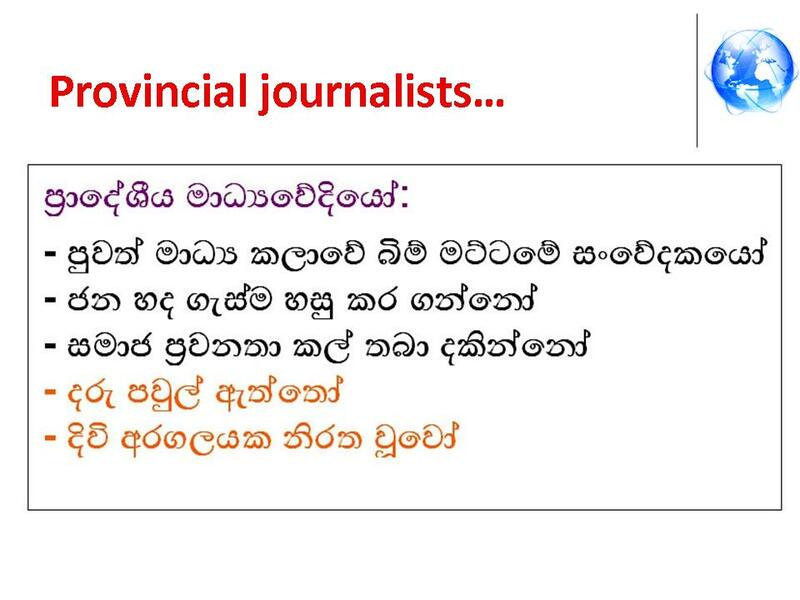 These are used on a discretionary basis by media companies mostly based in the capital Colombo (and some based in the northern provincial capital of Jaffna). Suppliers have no control over whether or how their material is processed. They work without employment benefits, are poorly paid, and also exposed to various pressures and coercion. I draw a rough analogy with the nearly 150-year old Ceylon Tea industry, which directly employs around 750,000 people, sustains an estimated 2 million (10% of the population) and in 2014 earned USD 1.67 billion through exports. 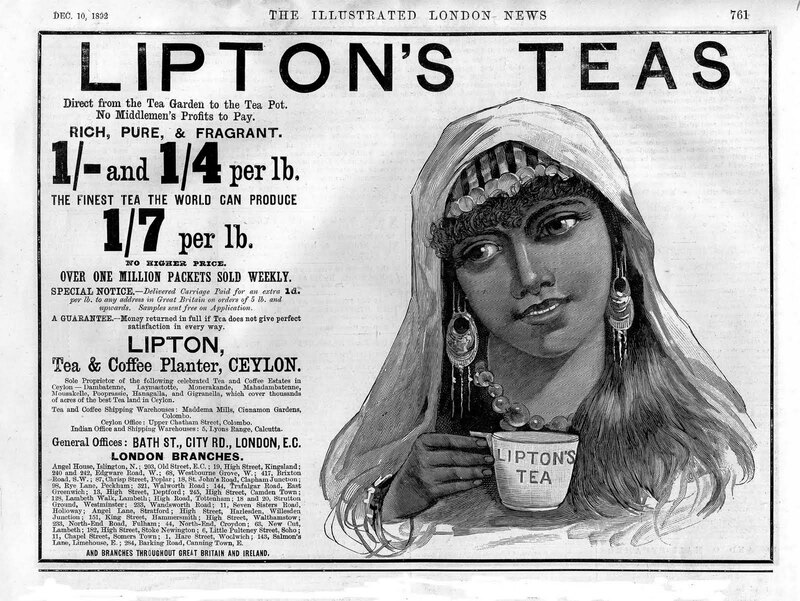 For much of its history, the Ceylon tea producers were supplying high quality tea leaves in bulk form to London based tea distributors and marketers like Lipton. 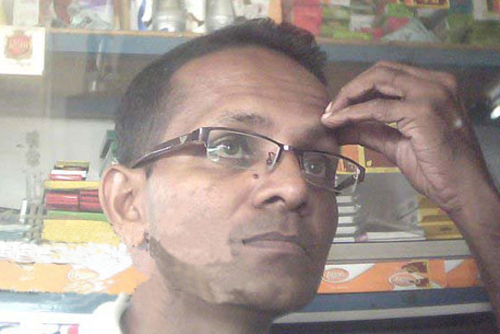 Then, in the 1970s, a former tea taster called Merrill J Fernando established Dilmah brand – the first producer owned tea brand that did product innovation at source, and entered direct retail. 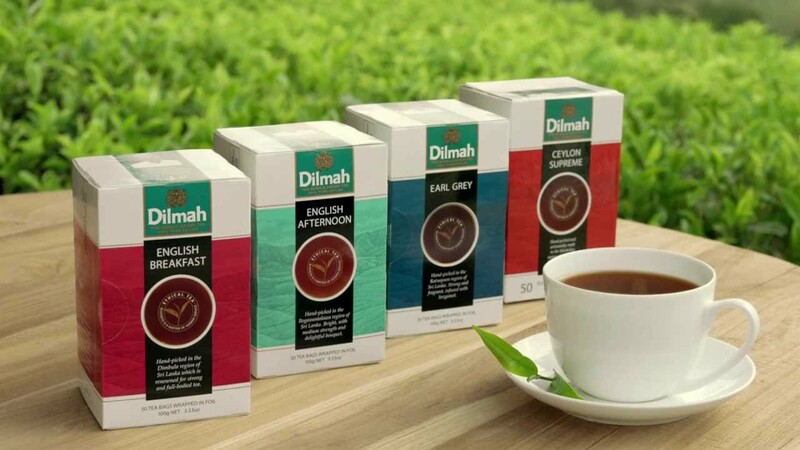 He wanted to “change the exploitation of his country’s crop by big global traders” – Dilmah has today become one of the top 10 tea brands in the world. 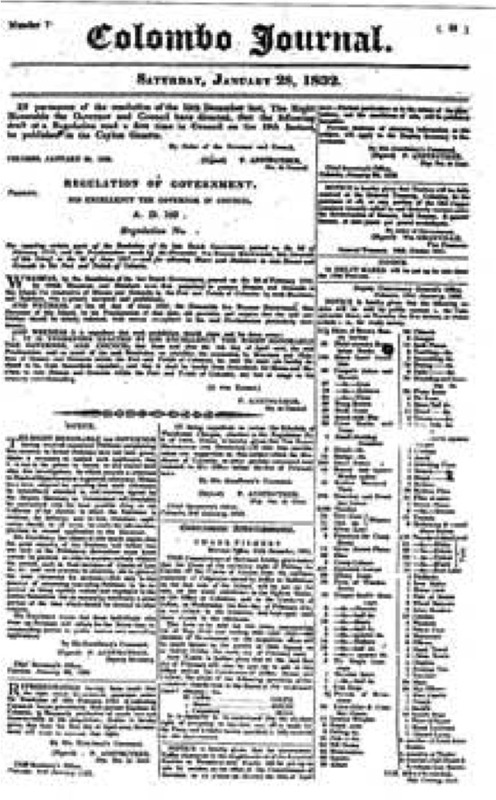 The media industry also started during British colonial times, and in fact dates back to 1832. 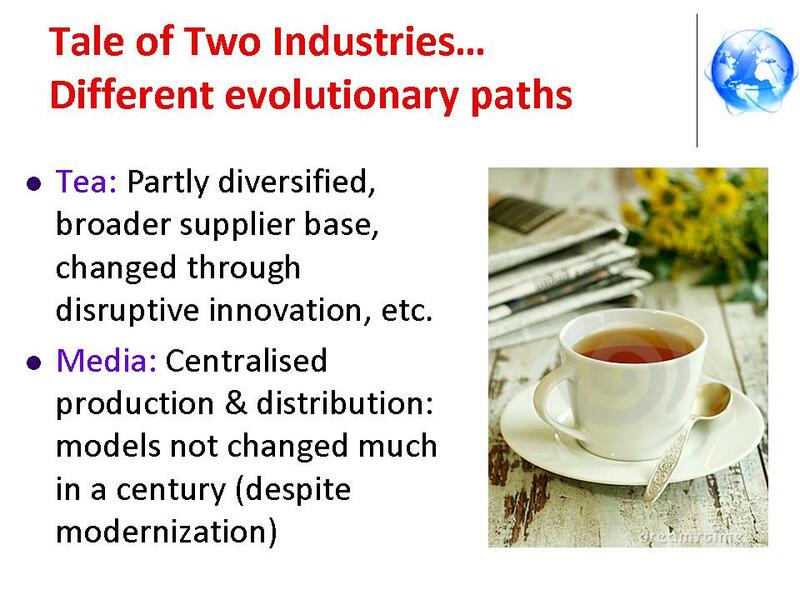 But I question why, after 180+ years, our media industry broadly follows the same production model: material sourced is centrally processed and distributed, without much adaptation to new digital media realities. I draw a parallel between tea small holders – those growing on lands less than 10 acres (4 ha) who account for 60% of Sri Lanka’s annual tea production – and the provincial journalists. Both are supplies at the beginning of a chain. Neither has much or any say in how their material is processed and marketed. Where are the Merrill Fernandos of our media industry? Who can disrupt these old models and innovate? Can disruptive innovators emerge from among provincial journalists? How can they leverage digital tools and web based platforms? What if they start value-adding at source and direct distribution via the web? But since they have families to feed, how to make an honest living doing that? Ozone Friendly Pure Ceylon Tea: The Cup that Cheers now Saves Ozone! On 21 September 2012, the UN Environment Programme (UNEP) will honour Sri Lanka for its long standing commitment to preserving the ozone layer. At a special ceremony at Jana Kala Kendraya (Folk Art Centre) in Battaramulla, a global plaque is to be presented to the Speaker of Parliament and Minister of Environment by Marco Gonzalez, Executive Secretary of UNEP’s Ozone Secretariat. The logo is already displayed by many Ceylon Tea manufacturers and distributors. It marks another value addition to the island’s best known export product, an industry worth US Dollars 1.5 billion a year. The logo reminds Ceylon Tea drinkers worldwide that their favourite ‘cuppa’ has been produced without harming the Ozone Layer. That means our tea is growing without any Methyl Bromide on tea plantations. Instead, ozone-friendly substitutes are now used as fumigants to protect tea bushes from pest attacks, particularly the nematodes (roundworms). The Montreal Protocol requires all Methyl Bromide use to end by 1 January 2015 (except in emergency situations and quarantine purposes). 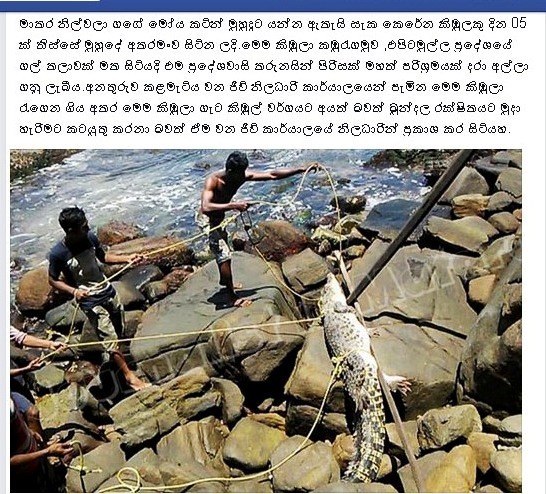 Sri Lanka got there ahead of schedule. “Sri Lanka is renowned for its creative activities to raise public awareness on ozone layer protection. 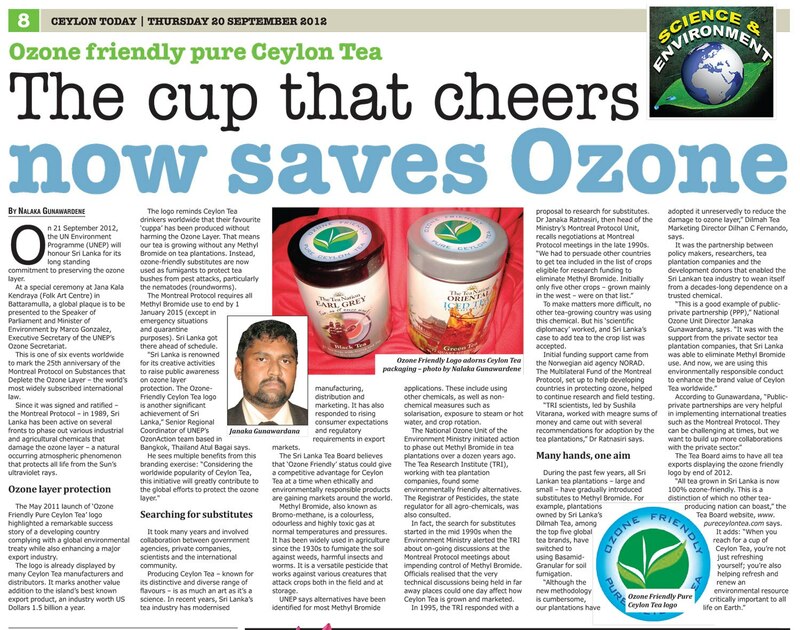 The Ozone-Friendly Ceylon Tea logo is another significant achievement of Sri Lanka,” says Atul Bagai, Senior Regional Coordinator of UNEP’s OzonAction team based in Bangkok, Thailand. It took many years and involved collaboration between government agencies, private companies, scientists and the international community. Producing Ceylon Tea — known for its distinctive and diverse range of flavours — is as much an art as it’s a science. In recent years, Sri Lanka’s tea industry has modernised manufacturing, distribution and marketing. It has also responded to rising consumer expectations and regulatory requirements in export markets. The Sri Lanka Tea Board believes that ‘Ozone Friendly’ status could give a competitive advantage for Ceylon Tea at a time when ethically and environmentally responsible products are gaining markets around the world. Methyl Bromide, also known as Bromo-methane, is a colourless, odourless and highly toxic gas at normal temperatures and pressures. It has been widely used in agriculture since the 1930s to fumigate the soil against weeds, harmful insects and worms. It is a versatile pesticide that works against various creatures that attack crops both in the field and at storage. UNEP says alternatives have been identified for most Methyl Bromide applications. These include using other chemicals, as well as non-chemical measures such as solarisation, exposure to steam or hot water, and crop rotation. The National Ozone Unit of the Ministry of Environment initiated action to phase out Methyl Bromide in tea plantations over a dozen years ago. The Tea Research Institute (TRI), working with tea plantation companies, found some environmentally friendly alternatives. The Registrar of Pesticides, the state regulator for all agro-chemicals, was also consulted. In fact, the search for substitutes started in the mid 1990s when the Ministry of Environment alerted the TRI about on-going discussions at Montreal Protocol meetings about controlling Methyl Bromide. 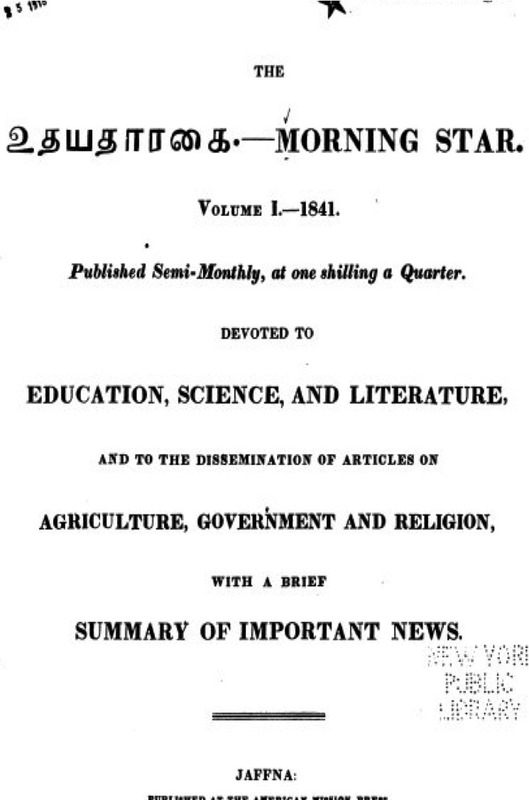 Perceptive officials realised how the highly technical discussions being held in far away places could one day affect how Ceylon Tea was grown and marketed. To make matters more difficult, no other tea-growing country was using this chemical. But his ‘scientific diplomacy’ worked, and Sri Lanka’s case to add tea to the crop list was accepted. In 1995, the TRI responded with a proposal to research for substitutes. Initial funding support came from the Norwegian aid agency NORAD. The Multilateral Fund of the Montreal Protocol, set up to assist developing countries in protecting ozone, helped continue that research and field testing. “TRI scientists, led by Ms Sushila Vitarana, worked with meagre sums of money and came out with several recommendations for adoption by the tea plantations,” says Dr Ratnasiri. 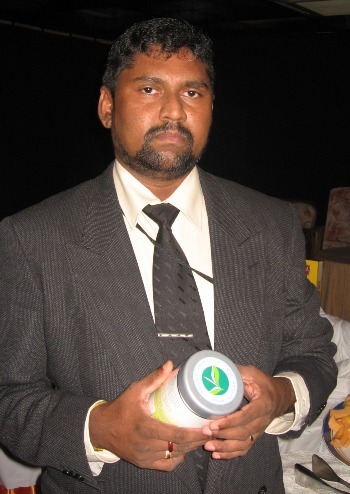 During the past few years, all Sri Lankan tea plantations – large and small – have gradually introduced substitutes to Methyl Bromide. For example, plantations owned by Sri Lanka’s Dilmah Tea, among the top five global tea brands, have switched to using Basamid-Granular for soil fumigation. “Although the new methodology is cumbersome, our plantations have adopted it unreservedly in order to reduce the damage to ozone layer,” says Dilhan C Fernando, marketing director of Dilmah Tea. It was the partnership between policy makers, researchers, tea plantation companies and the development donors that enabled the Sri Lankan tea industry to wean itself from a decades-long dependence on a trusted chemical. The Tea Board aims to have all tea exports displaying the ozone friendly logo by end 2012. “All tea grown in Sri Lanka is now 100% ozone-friendly. This is a distinction of which no other tea-producing nation can boast,” says the Tea Board website, www.pureceylontea.com.